The new RB Gordon Bell Grandstand at Iveagh Park. Reigning Irish Premier League champions Crusaders, will visit Iveagh Park to mark the grand opening of the RB Gordon Bell Grandstand, one of the finest hours in the 55 year history of the football club. For the Crues it will be their first game after the double Champions League header against Ludogorets of Bulgaria who have appeared in the group stages of the European competition for five seasons running playing teams such as PSG, Liverpool and Arsenal, with eight Bulgarian internationals in their squad. Aaron Black will welcome his former club to Iveagh Park. Stephen Baxter`s side has committed to grace the occasion in Rathfriland with a full compliment of their title winning squad for the 3pm kick off. The RB Gordon Bell Grandstand was initiated by the significant sponsorship of the late Mr RB Gordon Bell (deceased 2013) who was the club president from from when the club was first formed in 1962 until 2008 (46 years). 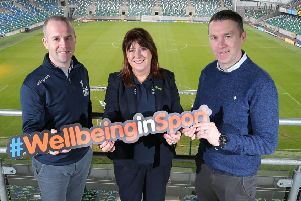 The club has also received support from the ABC Council and sponsorship from the local community of the 205 seats, which all makes for a significant event at Iveagh Park. In recent years many improvements have been made to the Iveagh Park`s facilities but the introduction of this comfortable and pleasant 205 seater structure surely tops the lot. Rathfriland FC plays a civic role in a rural community and uses the power of sport to bring people together - this visit of Crusaders fittingly marks this memorable and significant occasion for Rathfriland Football Club, the Bell family, ABC Council and the brilliant Rathfriland community. Could all seat sponsors please be in attendance at 1.30pm for a meet and greet and light lunch before the official opening of the RB Gordon Bell Grandstand. At half time Rathfriland FC Youth Under 8`s, 9`s and 10`s will be involved in junior small sided games football. At 5.15pm after the match there will be a £500 draw for all those who sponsored seats in the RB Gordon Bell Grandstand. Matchday sponsor for the flagship pre season friendly between Rangers and Crusaders this Saturday is David Murray (Seafin). David is a vice president of the club and a regular sponsor over the years – many thanks again goes to David for his great support to the football club. Meanwhile, Rathfriland Rangers face an interesting list of fixtures to kick off the new 2018/19 season. An opening day fixture on Saturday 4th August away to title rivals and last season`s Premier League winners Crumlin Star is followed by a midweek home league fixture against Derriaghy on Wednesday 8th August. On Saturday 11th August they host East Belfast in another testing league tie with a second midweeker away to Ballynahinch Olympic on Wednesday 15th August. Saturday 18th August sees Rangers travel again to Immaculata. An interesting list of fixtures tokick off the new campaign. Rathfriland Rangers` run of home pre season games commences this Tuesday evening when they take on Banbridge Rangers at Iveagh Park. This is followed by the Crusaders fixture on Saturday which also marks the opening of the new RB Gordon Bell Grandstand. The following Tuesday Rangers host newly promoted Danske Bank Premiership outfit Newry City followed by Ards on Saturday 28th July. The August committee meeting will take place on Monday 20th August at 7pm.